As I watched the last Wizards post season game, there was some sadness that overcame me. 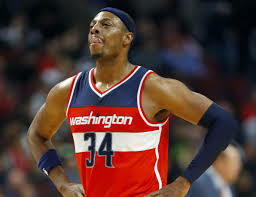 For years Paul Pierce has been disliked only because he hurt the Wizards as a Boston Celtic. After his signing to the Wizards I knew he would have a great impact and the fact he could no longer hurt us was a great plus as well. Since this could be his last season I wish he could stay longer. Even being in the league as long as he has, he can still be a major impact. It will be impossible to replace his talent and leadership on and off the court. The best we can hope is that his lasting impression will be in the Wizards locker room for years to come!